There are more than 70 different kinds of opossum found in eastern United States, Mexico, and Central America. The kind of opossum that lives in Pennsylvania and New Jersey is called the Virginia opossum. Opossums have the ability to “play dead." When they are in danger of being eaten by another animal, they just lie down and play dead. Many animals will not bother eating a dead animal. They prefer to kill their food. When the danger is over, the opossum gets up and walks away. The length of opossums ranges between 15 to 20 inches. Their tails can add 20 more inches. They use their hairless tails to hang from tree branches. They have long, pointed noses. Their fur is a grey color, but their face is white. They have thin, furless ears and hear very well. They have 50 teeth. Opossums have more teeth than any other land mammal in North American. Their four paws look somewhat like our hands. They have “fingers” with claws that are well suited for moving about trees. Fully grown opossums weigh between 9 to 13 pounds. The opossum is the only marsupial in North America. Marsupial means that the female opossum carries its babies in a pouch. After mating, it only takes about two weeks before baby opossums, called kits, are born. When born, baby opossums are the size of a honeybee. They are not fully developed when born. They must crawl up the mother’s stomach to her pouch where they will continue developing from their mother’s milk. She can only feed 13 kits. If more than 13 kits are born, those that do not make it to the pouch in time will die. Kits will stay in their mother’s pouch for about 10 weeks. After 10 weeks, they crawl from their mother’s pouch. She will take them to a nest where they will nurse for another 4 weeks. During this time, when the mother goes looking for food, all of the kits climb on her back. After a total of 14 weeks, the young are fully developed and are on their own. Opossums live for about 2 years. 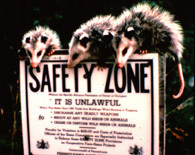 Opossums live in farmland areas or in wooded land areas near a stream of water. They sleep by day in nests made of dead leaves built in hollow trees or in an empty burrow. During very cold weather, they can lower their body temperature and save energy. They do not hibernate, but they live off of their body fat. Opossums are active at night. They look for food mostly on the ground. However, they will climb trees to find food. They have excellent hearing that helps them find moving prey. Opossums have a wide menu from which to choose their food. They are omnivores but prefer eating meat. Their diet includes eating eggs, small mammals, rotten meat, insects, fruits, grain crops, mushrooms, and small plants in winter. They have even adapted to eating left-over food scraps from garbage cans.